The fantastic world of letters from A to Z. And a little more. Enjoy together the world of the 26 marvellous creatures from „Elsewhere at Home“, a poetry book about a little more than just the alphabet for young and their parents. „Muppel“ is even trying to sing you a song – well. It’s trying. Merry christmas and happy holidays! 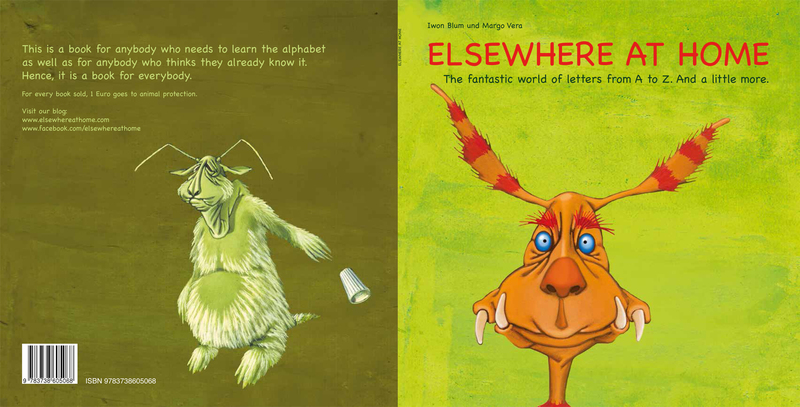 “Elsewhere at home” wants to bring the letters closer to our big and small readers. Each creature represents a letter of the alphabet. Every creature’s character and personality is described in a poem, which features the specific letter as often as possible. But “Elsewhere at home” is not an alphabet textbook in the classic sense. The creatures in this book wish for the readers to take the time and delve into their stories and environments. They hope for you to live in their world for a bit, maybe even think of a couple of adventures to have together. If anybody discovers their love for reading… that would not be too bad either. For every book sold goes 1 Euro to animal shelters. Also a coloring book will be available soon. Dieser Eintrag wurde veröffentlicht in book und getaggt mit abc, alphabet, book, children, christmas, elsewhere at home, fantasy, fun, gifts, illustrations, reading, x-mas am 14. Dezember 2014 von kamikatzezwerglis. Christmas has come early and your solution for a gift is here: Enjoy together the world of the 26 marvellous creatures from „Elsewhere at Home“, a poetry book about a little more than just the alphabet for young and their parents. Merry christmas and happy holidays! Dieser Eintrag wurde veröffentlicht in book und getaggt mit abc, alphabet, book, children, christmas, elsewhere at home, fantasy, fun, gifts, illustrations, reading, x-mas am 7. Dezember 2014 von kamikatzezwerglis. Dieser Eintrag wurde veröffentlicht in book und getaggt mit abc, alphabet, book, children, christmas, elsewhere at home, fantasy, fun, gifts, illustrations, reading, x-mas am 30. November 2014 von kamikatzezwerglis. Dieser Eintrag wurde veröffentlicht in book und getaggt mit abc, alphabet, book, children, elsewhere at home, fantasy, fun, illustrations am 16. November 2014 von kamikatzezwerglis.